What do you do when the weather finally gets warm? You take your new bike to the park, of course! Of course you do. What a little cutie pie too. Him not the bike. Delightful picture. Although we are at the start of winter here it feels like a lovely spring day today. Whoopee! Hope you have a lovely week. This photo represents beautiful weather indeed! I bet y'all had such fun! That smile on his adorable face is precious!! Look at that face! Adorable, simply adorable. 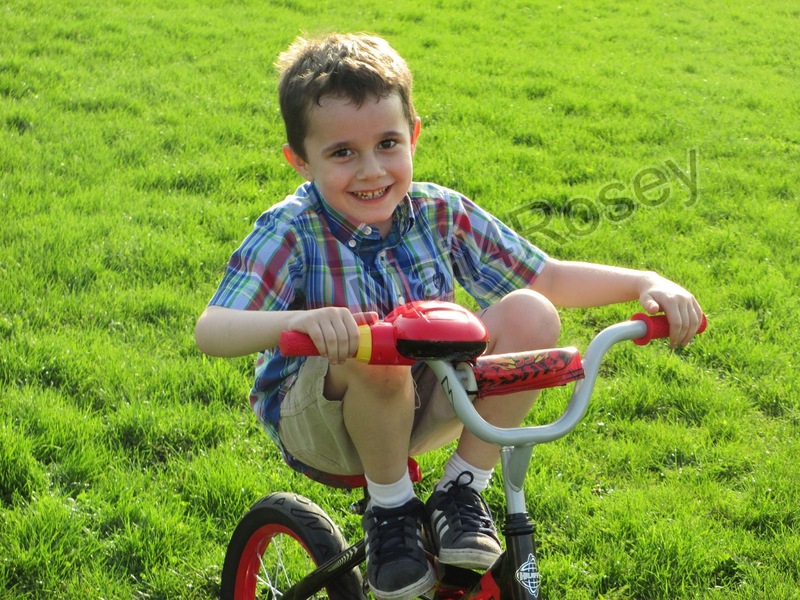 Yes, I love that picture, very happy with his tricycle. Greetings. What a sweet little face and the perfect weather for bicycling, yay! He looks happy on his bike! Keeping my fingers crossed the weather stays tolerable. Yes. Great idea! Looks like he is enjoying his new bike..and even doing some trick riding there! :)We've already taken a family bike ride - so much fun! Looks like he really likes that new bike! My boys have been out bike riding a lot this past week, too! It's supposed to snow in Nebraska the next two days. I'm ready for that to end! Since it's spring, I'm going to say it's my favorite season. I LOVE being outside. :D This is a great photo, too. Have a great May Day! A new bike? And a happy grim. Warm sunshine. Can life get any better than this? And happy day to you, dear Rosey. Ahh yes - worthy weather indeed - FINALLY! Enjoy it. Lovely picture. Stopping by from the WW hop. Have a great day! Sounds like an excellent idea! We haven't had our bikes out in eons. It sure would be lots of fun to ride them around Cades Cove in the Smoky's. Great photo to share with your WW buds! Awh Rosey! Thanks for your fun comment about your weather over the weekend. Did you see today's post? We had 32° again last night. It is so cold here but sunny. Tomorrow the temps should be more like May should be. His beautiful smile says it all. Happy WW! Whoo Hooo! Aren't you so happy bike weather is here!? I know he sure looks like he is! AMEN! Outside is definitely the place to be when the weather warms up. How adorable! That smile alone would light up the room. How fun!! He looks as happy as I am that it is finally warm out. Hey Rosey: Thanks for stopping by my friend, and for sharing this sweet child's smile! Ahhhhh I remember when my boys were that little! If only I could turn back the hands of time! :( Have a great day! So fun! We went to the park yesterday afternoon too! your son is adorable!! what a gorgeous day at the park...this weather makes me happy and gives me energy! so glad you and your son had a nice day together! Great! He clearly enjoyed himself! I was able to see the words 4 times with no problem. Love that innocent smile :) precious click! The weather here can't decide what it wants to do. One day it's 80 the next it's 60. We're using it the best way we can! So cute! But now I'm all tongue tied :) haha! Yay for warm weather. I think we skipped spring and went straight to summer in the south. What a great picture, he's such a little sweetie, who looks to be having a great time! I just want to be outside more!